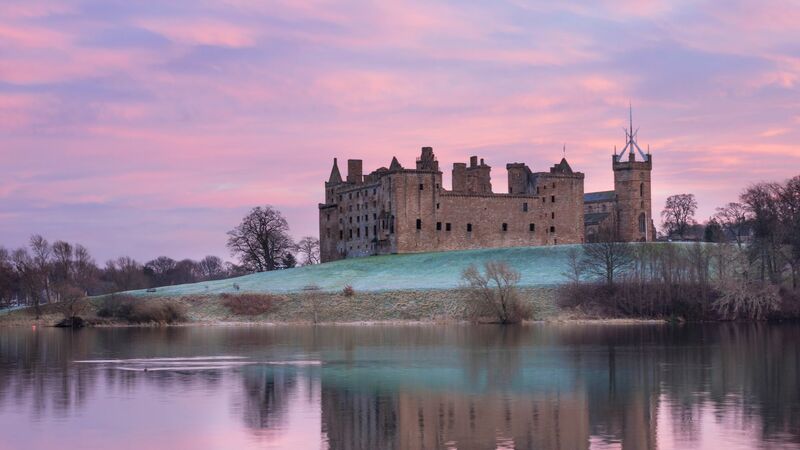 Give your wintry escape that special touch with Scotland’s warm hospitality and magical surroundings on this self-drive holiday. Experience the old-world charm of Edinburgh and take a relaxed-pace road trip along Scotland’s east coast and central Highlands. By day, take in attractions such as the town of St Andrews, the valley of Glencoe, and the Loch Lomond and Trossachs National Park. Please note that certain dates have limited availability due to major events and festivals in Edinburgh. If you are unable to book your preferred arrival date, please contact us for assistance. Attractions Just a few of the majestic sights you’ll take in during your trip. A day-by-day plan to guide your journey. At Edinburgh Airport you will be met in the arrivals hall by a private driver who will bring you to your charming accommodation in Edinburgh. After settling in, go out and explore the charming capital city. 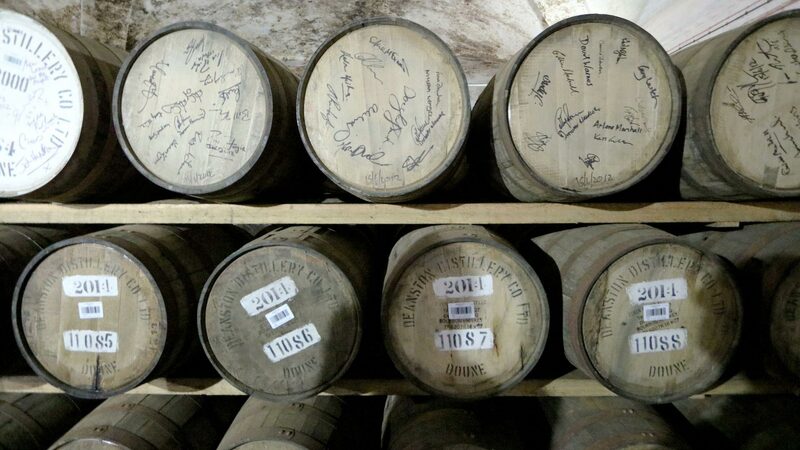 There are plenty of restaurants and bars to enjoy some warm Scottish hospitality — not to mention a taste of the local whisky. Spend the night in Edinburgh. 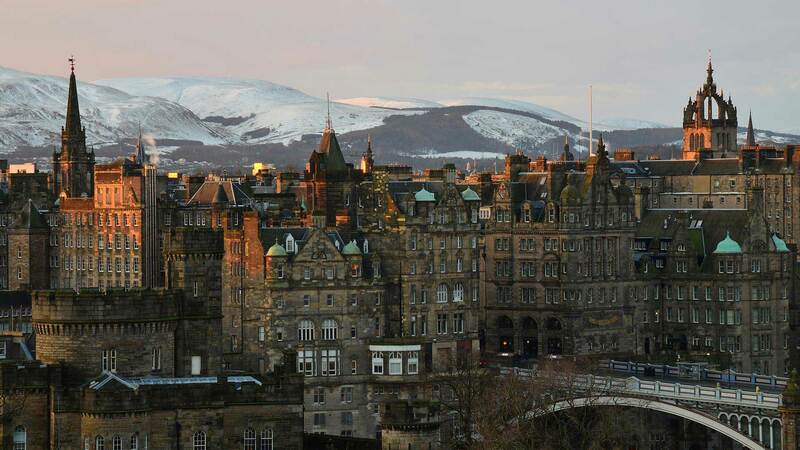 Today is free for you to explore Edinburgh as you wish. This city has a long and storied history, so there’s no shortage of UNESCO World Heritage Sites, museums and landmarks to visit. This includes the majestic Edinburgh Castle and the official Scottish residence of Queen Elizabeth II, Holyrood Palace. As you can easily travel around the city centre on foot, we recommend strolling along the historic Royal Mile or walking to Castle Hill for a spectacular view of the city. Spend another night in Edinburgh. Start your drive today across the remarkable Forth Road Bridge and follow the scenic coastal route around the East Neuk of Fife. Visit the enchanting fishing villages of Anstruther, Elie and Pittenween on your way to St. Andrews. Explore this beautiful and historical city, famous for its old ruins, the Royal and Ancient Golf Club that was founded in 1754 and the University of St Andrews, the oldest in Scotland dating back to 1410. Continue onwards to the lovely village of Dunkeld, perched on the banks of the River Tay, where you can visit the atmospheric cathedral ruins. In the nearby Hermitage area, you can take a scenic winter walk through the peaceful woodlands to view the Black Linn Falls and Ossian’s Hall of Mirrors. Spend the night in Perthshire. Spend some time in the town of Pitlochry. 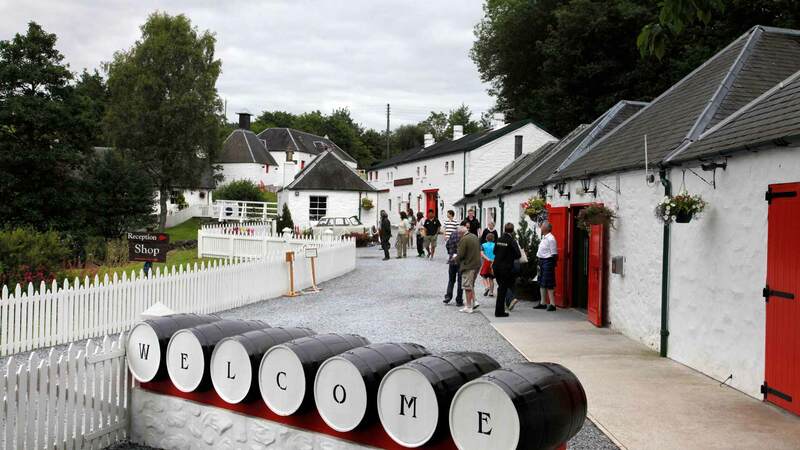 Besides the charming Victorian atmosphere, this town is renowned for its accessibility to great walking trails in the surrounding scenic hills as well as Edradour Distillery, the smallest whisky distillery in Scotland, where you can warm up with “a wee dram”—a shot of single malt Scotch (the distillery is closed on weekends, alternatively you could visit Dalwhinnie Distillery on your journey north). 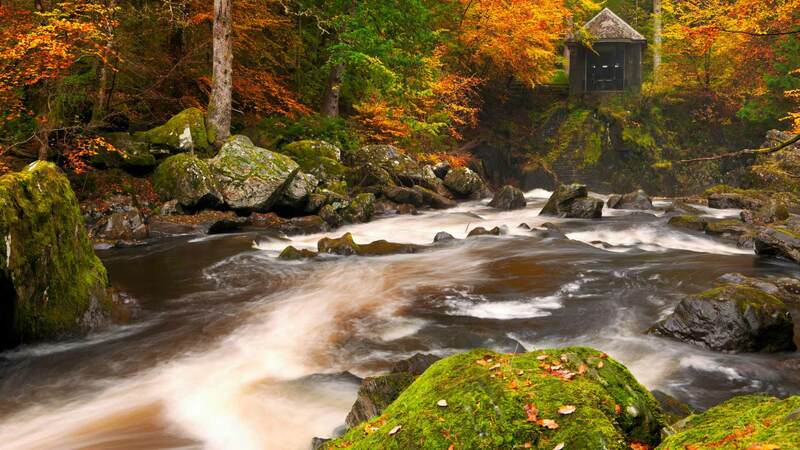 Travelling north towards the Cairngorms National Park, you can stop for walks at the Pass of Killiecrankie, an impressive wooded river gorge, and the charming Falls of Bruar, a series of waterfalls along the Bruar Water. You can also visit the atmospheric ruins of the Ruthven Barracks, situated on a mound visible for miles around, or take a short detour to the Highland Wildlife Park, a wonderful place to see both native Scottish wildlife and endangered animals from around the world. From there, drive to Glenfinnan, where you can visit the Glenfinnan Monument, a tribute to the Jacobite clansmen, overlooking the mysterious and beautiful Loch Shiel. Spend the night in the Fort William area. 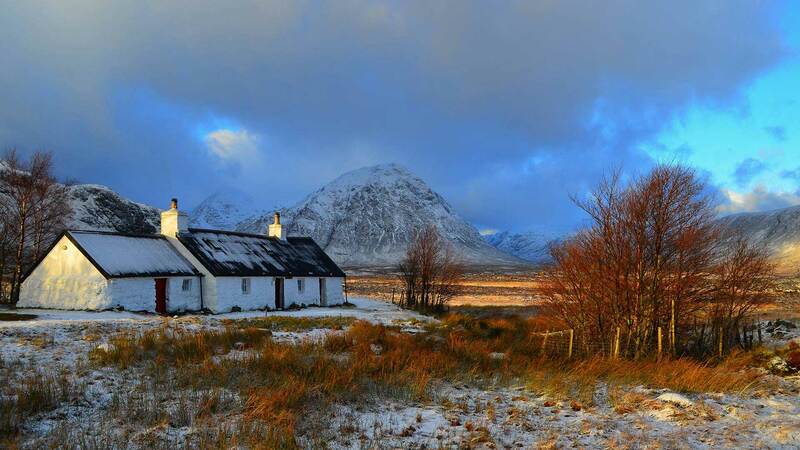 Head to the magical Glen Coe, a valley combining famous Highland scenery and history. 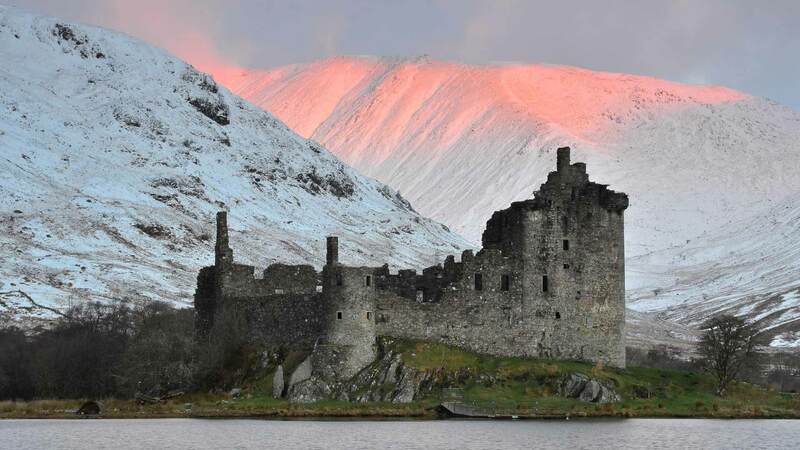 On your way south, stop for a walk at the atmospheric Kilchurn Castle at Loch Awe— one of the most picturesque castles in Scotland—that was built in the 15th century by Clan Campbell. While it is closed during the winter time, you can still walk around the area and take some fantastic photographs. You can also stop at the charming village of Inveraray with its white washed houses on the shores of Loch Fyne, before reaching Loch Lomond in the late afternoon. We recommend a walk in the ancient village of Luss, with its characteristic stone cottages overlooking the shores of the loch. 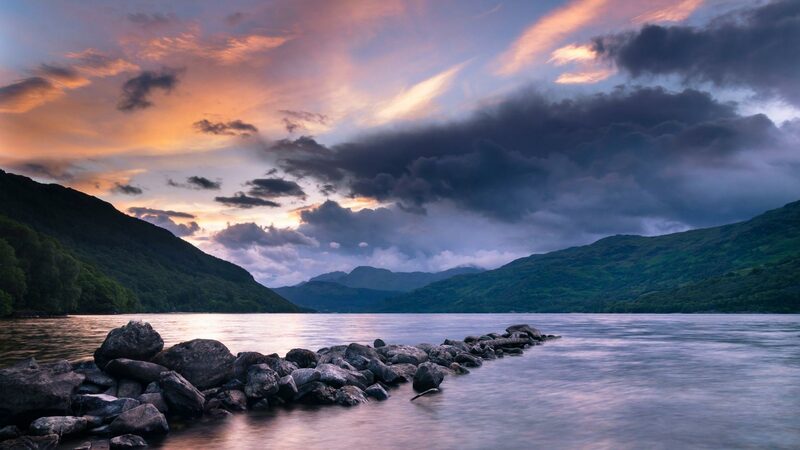 Spend the night in the Loch Lomond / Trossachs National Park area. It's time to head back to Edinburgh today. You may wish to do some light hiking in the beautiful Loch Lomond and Trossachs National Park area this morning. For a fun photo opportunity, don’t miss Doune Castle, which is featured in the classic film Monty Python & the Holy Grail and the Outlander TV series as “Castle Leoch”. Another ideal place to visit is Stirling Castle and the monument dedicated to William Wallace, the rebellious Scottish knight and subject of the film Braveheart. Other worthwhile stops, depending on your time, include Linlithgow Palace and the Kelpies, two giant horse head sculptures that make for a great photo opportunity. Back in Edinburgh, return your rental car and enjoy the rest of the day at your leisure, perhaps with a fine dinner to top off your amazing journey. After your memorable adventure, enjoy a comfortable private transfer back to Edinburgh Airport.. If your flight is in the afternoon, use the morning to enjoy some last-minute shopping, visit one of Edinburgh’s museums or simply relax and take in the old-world atmosphere of the city. If you wish to spend more time in Edinburgh or Glasgow before or after the tour, ask your travel consultant about adding extra nights or services, such as private airport transfers. We can also extend your trip with other destinations in the Nordic region such as Iceland or Norway. Contact us for details about customizing your itinerary. Here’s a map of your travel route, to help put things in perspective. Don’t worry, we’ve got this covered. These should tide you over until you’re in Scotland to take your own pictures. Sleep soundly, in the accommodation type of your choice, and wake up ready to enjoy another day of exploration. Rooms with private WC and shower (or bath) in a three-star hotel, B&B, well-appointed guesthouse or similar. All provide breakfast.. Rooms with private WC and shower (or bath) in a boutique guesthouse, three- or four-star hotel or the best accommodation of that s.. Enjoy your journey with two driver authorization, free GPS and excess waiver insurance as standard. Monthly price comparison Our best price per person when booking for two. We recommend that all our travellers read through the following information about driving in Scotland, what the tour includes, the itinerary, accommodation, and other useful information for your travels. This is a self-drive tour, which means you will follow a detailed and personalised itinerary during your road trip in Scotland. No dedicated driver or tour guide is included. All accommodation, rental vehicle, and other planned activities or added services will be pre-booked by Nordic Visitor (as specified in the itinerary). As this is a self-drive tour, you are welcome to stop when and where you wish on your drive. Except for accommodation and booked activities, other highlights we’ve listed in the itinerary are suggestions based on Nordic Visitor favourites. Our team of local travel experts carefully selects hotels, B&Bs, and guesthouses around the country based on excellent ratings, personal experience and comfort. Generally, in Scotland, whilst room sizes may vary, our room types are based on European standard sizes. Please note that twin rooms, triple and family rooms are not commonly available in Scotland, so please contact us for booking assistance if that is something you would like. Please also be aware that, due to the historic nature of the properties we usually select, most of the rooms are only accessible by going up stairs, as there are often no lifts available. Please contact us if you are not able to walk up stairs. 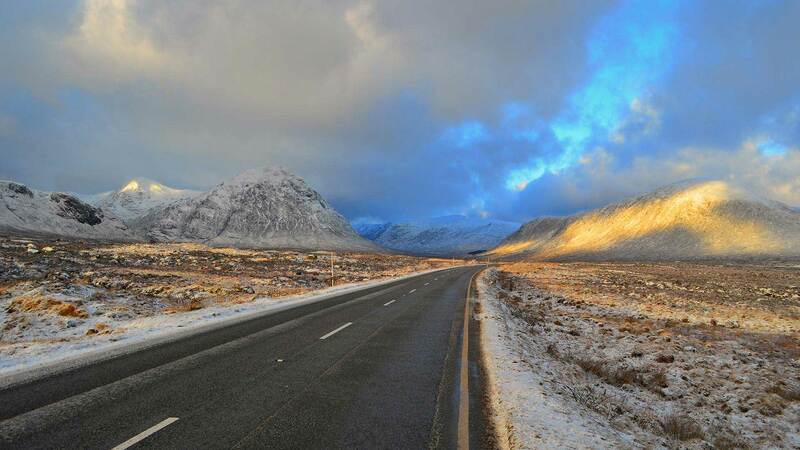 The roads in Scotland are usually in good conditions, even in winter, and are renowned for their road trip worthiness. Please be aware that in the UK motorists drive on the left side of the road (and on the right side of the car). If you are not used to driving on the left, we highly recommend choosing a vehicle with automatic transmission for your self-drive tour. If you want a manual transmission vehicle, keep in mind that you will need to shift gears with your left hand (floor pedals are the same). Drivers will also have to get used to the narrower roads of the UK as well as the rural single-track roads with passing places and be careful of animals on the road. For inexperienced drivers who still want to explore and discover Scotland, we recommend one of our privately guided tours, where you will have a local, experienced guide at the wheel. If you are planning on arriving in Glasgow, you could book a private transfer from Glasgow Airport to your accommodation in Edinburgh to start the journey in a comfortable way. During certain tours, you will have the options to end your trip in Glasgow, rather than Edinburgh, as well if that is more convenient for you. As you will be travelling over the winter season, please note that sightseeing and transport is dependent on weather and road conditions and might need to be altered if conditions are not favourable. This includes ferries and drives. We recommend being particularly careful when driving during the winter months, especially in the Highlands where it snows more often, and always checking the weather conditions before leaving your accommodation in the morning. If something unexpected occurs, you can call our 24-hour helpline to speak directly with a Nordic Visitor staff member. All bookings are charged in British Pounds (£, GBP). Prices displayed in other currencies are indicative only and based on the daily exchange rate. Therefore, conversions from GBP to other currencies will fluctuate from day to day. After booking your package with Nordic Visitor, you will be contacted within two business days by one of our travel consultants who will serve as your dedicated contact person for all your travel needs before, during and even after your holiday. Your travel consultant will provide you with details about your booking and your remaining payment (if not paid in full). You will also receive more information about what to expect during your holiday. This is your trip, what are you interested in doing?